Anything that saves me time in the kitchen is a plus in my book; specially during the hot months of summer. I haven't tried it yet, but my gut is telling me this crust would work well for any fruit pie. So pick your favorite and start baking. Of course less time in the kitchen means more time "hunting" for ingredients; and one of my favorite places to do that is Whole Foods Market. Whether your a novice or newbie at Whole Foods be sure to enter below for a chance to win a $25 gift card. In a medium pot, bring the berries, sugar, and water to a boil, simmer until berries are tender. Whisk the cornstarch with a few tablespoons of water in a cup, until the lumps are gone. Then whisk the mixture into the berries. Stir frequently until it thickens. Remove from heat and refrigerate until cold. In a large bowl, combine the oats, flour, sugar, zest and salt. 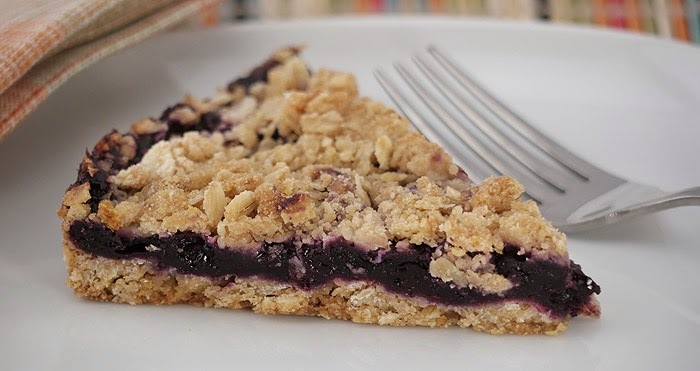 Cut in the butter, using a pastry blender or fork, until it resembles small crumbs. Press half of the oat mixture into a pie dish. Pour the cold berry mixture over top and sprinkle with the rest of the oat mixture. Bake for 45 minutes at 350F, until the top is golden brown. Let cool before cutting. Did you use fresh orange zest or dried? I'm a regular. I have a tight budget, but I find great deals there all the time. Regular! I was just there today! I am a newbie and I love it! I'm not a regular but I stop in mostly for cheese when I am on that side of town. I am one of your instagram followers. I'm a regular, for the produce, ricotta, 360 products, breads, and Italian cookies. regular!! love love love Whole Foods! I am neither; I am an occasional Whole Foods shopper. I love to go when they have sales on stuff I want. I regularly go there for local milk! Im an intermediate shopper, i don't go regularly, but i have been there occasionally. Its a little to pricey for me. Mmmm this is perfect! I'm a bit lazy when it comes to making dough...sometimes I just won't want to wait! I have to try this...it looks so delicious. I'm at Whole Foods quite often. Love the cheese selection, green drinks, and hot & cold buffet. I go to Whole Foods when I can, but it's 45 min from home, so not often. I've been there before but it's been awhile! I have never been there! We have one not too far away that is fairly new. I really should go and check it out! Sounds like they have such great healthy selections! I've never even been inside a Whole Foods before! There are so many small health and natural food stores where I live that I just haven't had to go there yet. But I would if I won! Not a regular but not a newbie either. The closest one is over 30 minutes away so I only go when I head that direction. I have purchased items at Whole Foods twice, but wandered the store drooling over their stuff on many occasions. I am a semi-newbie to whole foods, but when ever I am close to one of their locations I make sure to go! This pie looks amazing too! Thanks for hosting this and I'm so glad I won, as they carry a few items I can only get there. Happy Whole Foods Santa Barbara to me!!! !